And a few weeks back, a reader (Susan Jordan) asked if I could procure the recipe for the famous Kosmo Deli sauce, which is a sweet and spicy condiment that comes with their bi bim bop and bulgogi specialties. I did my best, but their secret recipe is as guarded as Fort Knox gold. Ann Arbor, from my perspective, is in a Korea state of mind. My mission, therefore, was clear: To recreate bulgogi and a Korean-styled pepper sauce in my own kitchen then use the leftovers to make Bi Bim Bop. One of the more difficult parts of this exercise would be crafting recipes that would not offend Koreans. On my last trip to California, I devoured a Bulgogi Taco, which was a memorable lunch of spinach, sprouts, beef, and kimchee loaded onto a flour canvas then drizzled with a sesame vinaigrette and spicy pepper paste. But I wondered if one could purchase a Bulgogi Taco in Korea. Or how about a Bulgogi Burger or a Bulgogi Pizza, or other bulogi-based recipes Americans have blogged about. Though these treats are undoubtedly delicious, I controlled my inbred tendency to put my American stamp on these beloved specialties. But I have no Korean grandmothers or friends who have Korean grandmothers to consult. My work, therefore, was cut out for me. I’m a neophyte, a babe in the woods, when it comes to this great world cuisine. To date my only foray into Korean cooking has been experimenting with Hot Pots, which added breadth and interest to my soup repertoire. As I created these recipes, slurping Hot Pot at Arirang, I began to understand that Korean food, as the country itself, is a study in contrasts: fresh and fermented, cooked and raw, sweet and spicy. I set about doing my homework googling bulgogi and bops until they blushed. I also consulted with Ms. Kim at Hyundai Asian Market, a gem of a store on Platt Road, which is stocked floor to ceiling with Korean foods. I told Ms. Kim I wanted to make an authentic bulgogi and bop, as well as a sweet and spicy sauce for both. She led me to shelves loaded with Seasoned Red Pepper Paste, of which the essential fermented condiment, gochujang, was the main ingredient. She explained this seasoned paste was what many Koreans, including herself, use. I decided to serve my bulgogi, kim chee and pepper sauce with rice and lettuce leaves for wrapping, similar to Korean-styled dishes I’ve eaten in the past. My brow-raising detour from authenticity was substituting vermouth for the sake and mirin; my refrigerator can only hold so many condiments. As well, at a traditional Korean restaurant, you might also cook your meat on a tabletop grill. Again, my kitchen can accommodate only so many apparatus; a hot sauté pan will suffice. The following recipe is ridiculously delicious, a sure-fire way to ignite a party in your mouth, as well as with your friends. It wouldn’t hurt combining the beef with sauteéed onions. And if your buddies are more burger than lettuce folks, serve the meat on a soft Asian or challah roll. Combine the Korean Red Pepper sauce with mayonnaise and spread lavishly on the cut sides of a soft roll. 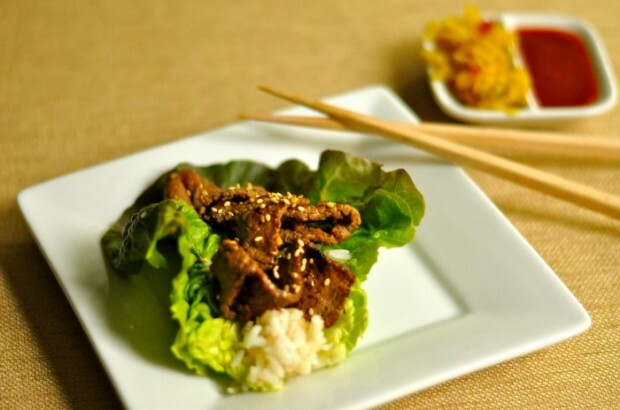 Load the bun with bulgogi and top with unctuous kim chee, Korean-styled fermented vegetables. The internet if packed with kim chee recipes, and kim chee is available at most grocery stores; mild kim chee is spicy enough for most American palates. The homemade cucumber kim chee from the Hyundai Asian Market is a favorite. Let’s not forget the children. Substitute ketchup for the Korean sauce, and lettuce and pickles for the kimchee – fast-food burgers will be a distant memory. I’m using the leftovers in a component for Bi Bim Bop tomorrow. A fine last supper, indeed. Whisk together soy sauce, sesame oil, apple cider or juice, vermouth, garlic, ginger and 2 tablespoons sugar. Stir in onion, pear and sesame seeds. Add additional sugar to taste. Place in extra-large resealable plastic bag or in a bowl large enough to accommodate beef. Marinate at least 3 hours, refrigerated, and up to 48 hours. When ready to serve, remove meat from marinade and drain on paper towels. Heat a large, dry sauté pan over high heat a minute, then add meat to pan without crowding. Cook until golden on each side then remove and reserve. Repeat process with remaining meat slices. Top beef with additional sesame seeds and green onion, if using. Serve with lettuce leaves for stuffing, white rice, kim chee and Korean Red Pepper Sauce. *Asian pears are availble at Hyundai Asian Market and other groceries; or substitute with another large, peeled firm- ripe pear. Note: I froze the meat, then allowed it to sit at room temperature for 2-3 hours. This allowed me to slice the beef in paper-thin slices against the grain, partially frozen, with ease. Whisk together pepper paste, sesame oil, sugar and 1 tablespoon of water. Delicious with Korean specialties such as Bulgogi or Bi Bim Bop.